Received too late for review: Vol. 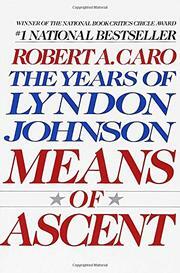 II of Caro's monumental history of LBJ. Through what the publisher calls "a special distribution arrangement," books will arrive in bookstores around the country on one day only, 3/14--possibly to orchestrate interest in what the publisher describes as "the heart of this book," Caro's revelations about exactly how Johnson won--by 87 votes, in a runoff campaign that's been tainted by rumor for 40 years--the Texas senatorial election of 1948. Even those revelations aside, this volume--with a first printing of 250,000--is likely to be extraordinary: Vol. I, The Path to Power, was named best nonfiction book of 1982 by the National Book Critics Circle, while Caro's 1974 biography of Robert Moses, The Power Broker, won a Pulitzer.